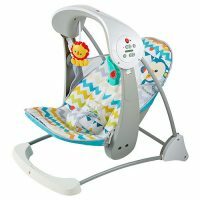 Easily converts to stationary calming vibrations baby seat. 10 tunes and 2 soothing nature sounds. Comfortable, padded soft seat with machine-washable seat pad. Folds flat with an easy-carry handle to take-with anywhere.